Relay team “Deena and the Bambinos” with Akron Children’s CEO Bill Considine (left to right) Olympian Deena Kastor with Akron Children’s employees Dr. Shefali Mahesh, Lauren Pearch, Cortney Myer and Denise Young. When you get the news you’re going to meet an Olympic athlete, one might be pretty excited. When you find out you get to run with one of the most accomplished distance runners in American history and a 3-time Olympian, one might be a little intimidated. 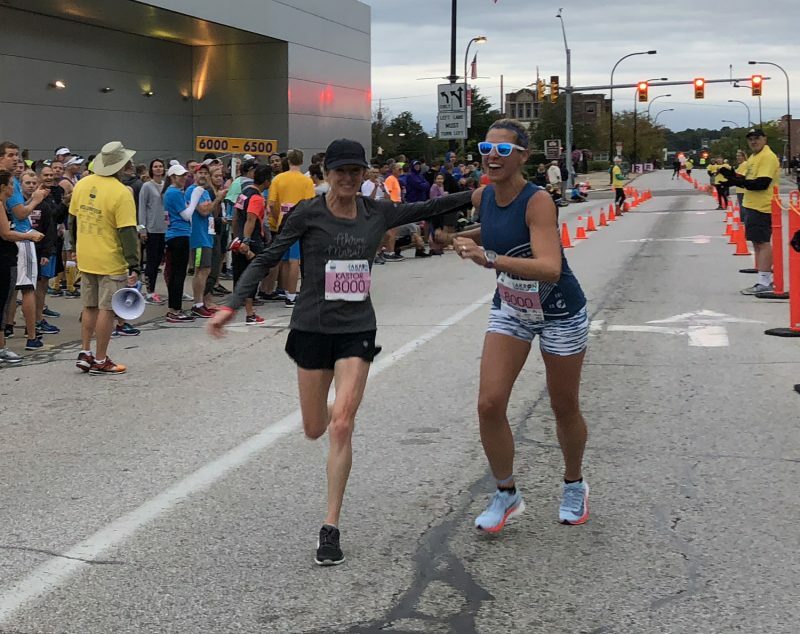 But for four Akron Children’s employees, they not only embraced the opportunity to run with this year’s Akron Marathon ambassador, Deena Kastor, they did it in epic fashion. They placed 3rd in the all-female relay team category, with a time of 3:26:54, while stopping mid-race to provide medical assistance to a young man in need. When Deena Kastor said she hoped to run the first leg of the FirstEnergy Akron Marathon, Half Marathon & Team Relay, Akron Children’s jumped at the chance to help her assemble a 5-person relay team. The group, “Deena and the Bambinos,” consisted of one Olympian, 2 nurses, a physician and a physical therapist, having never run together before, but all sharing a passion for running. For Denise Young, outpatient surgery nurse at Akron Children’s, running with Deena was a once-in-a-lifetime opportunity. 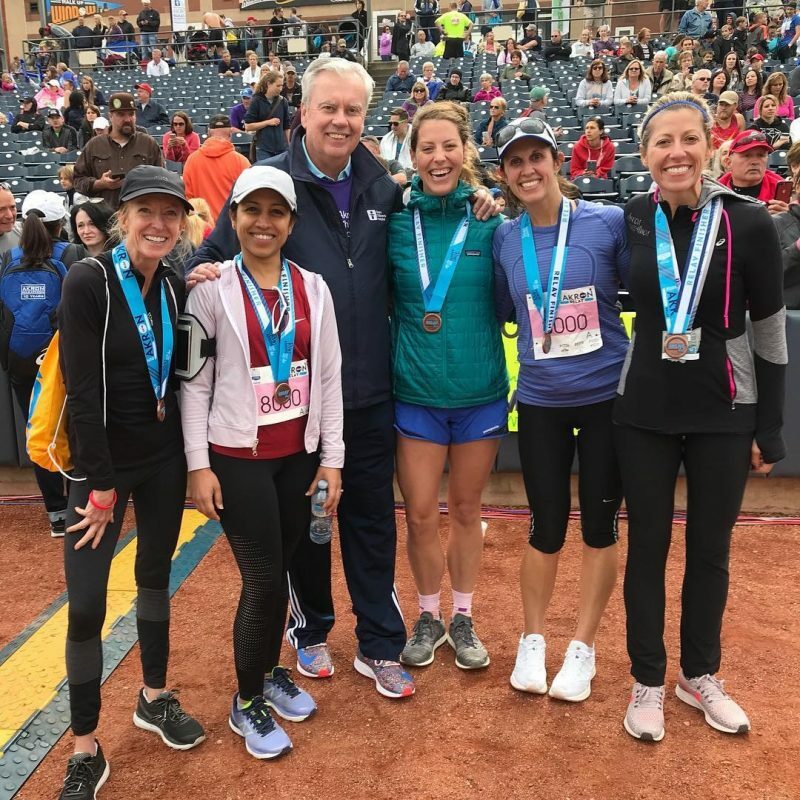 When Cortney Myer and Dr. Shefali Mahesh got the invite to run with Deena, it superseded their own personal goals for the Akron Marathon. Cortney had been training to run her first full Akron Marathon and Dr. Mahesh planned to run the half marathon. Although hours had been invested in training, the chance to meet and run with Deena in a hometown race was too much of a good thing to pass up. Since all the runners were capable distance runners, pacing for a shorter run was different, but nothing they couldn’t handle. But as Cortney waited at the last relay exchange zone for Lauren, she began to think something was wrong. Lauren was several minutes off pace, which wasn’t like her. Turns out, the ultramarathon runner wasn’t injured, she was busy doing what she loves as much as running, helping others. Mid-race, Lauren saw a situation that she couldn’t run past. And running the race for the kids is a big part of the race. 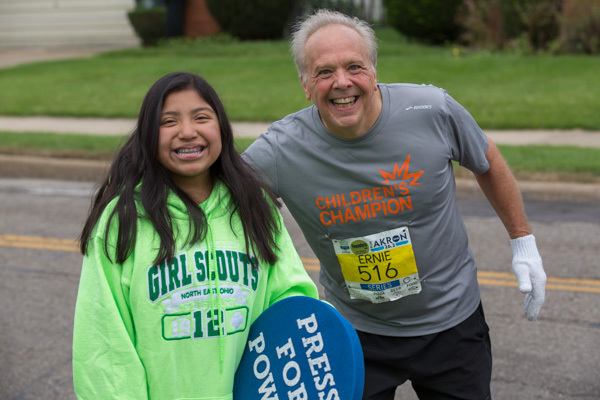 As the title beneficiary of the Akron Marathon Race Series, race registration proceeds support the work that’s done at Akron Children’s Hospital. Support for the hospital is also visible during the race at the Hero Zones, where patients are stationed along the race route to serve as inspiration for the runners. Several members of the relay team knew this year’s Heroes personally. Finding inspiration is what the Akron Marathon seems to embody for many runners, including the all female relay team. After getting to run with an Olympian, what’s next for the group? More running, of course. Lauren is training for a 100k run in Arizona, Dr. Mahesh and Cortney will be back for the Akron half and full marathon respectively, and Denise is focused on the Cleveland Marathon next and will run in all 3 races of the Akron Children’s Hospital Akron Marathon Race Series again next year.